The behaviour and hence the possible impact of trace gases and solids in the atmosphere is now of major concern amongst scientists. 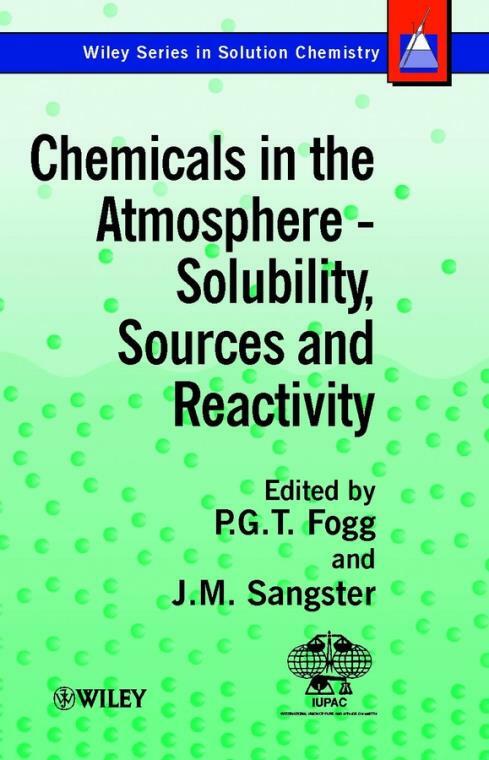 This book is a result of discussions between members of the IUPAC Commission on Solubility Data and the IUPAC Commission on Atmospheric Chemistry extending over several years. The book provides a broad survey and theoretical basis of many aspects of the behaviour of stable and unstable chemicals in the atmosphere. There is special emphasis on heterogeneous processes at all levels of the atmosphere. Modern techniques of investigation and of modelling such processes are discussed and many experimental data relating to interaction of gases with cloud droplets and with surfaces of solid particles are included. A detailed account of theoretical and practical aspects of Henry′s law constants, including their relationship to infinite dilution activity coefficients, is also presented. Experimental values of 15 inorganic and 153 organic stable compounds have been compiled and evaluated for dissolution in pure water and, in some cases, seawater. This volume will be of interest to chemists and environmental scientists, as well as geochemists and others involved in atmospheric modelling. Researchers associated with aerosol and air quality studies, as well as pollution issues, will also find it of interest. The sections on Henry′s law constants will be of particular benefit to chemical engineers. Chapter 1: General Behaviour and Origins of Greenhouse and Significant Trace Gases. Chapter 2: Presentation of Solubility Data: Units and Applications. Chapter 3: Thermodynamic Aspects of Henry′s Law. Chapter 4: The Experimental Measurement of Henry′s Law Constant. Chapter 5: Calculation of Henry′s Law Constants and Infinite Dilution Activity Coefficients – An Overview. Chapter 6: Details of Specific Methods of Predicting the Solubility of Organic Compounds in Water. Chapter 7: Solubility of Gases in Strong Electrolyte Solutions. Chapter 8: Details and Measurement of Factors Determining the Uptake of Gases by Water. Chapter 9: Accommodation Coefficients, Uptake Coefficients and Henry′s Law Constants of Gases which React with Water or are Unstable. Chapter 10: Solid Particulates and Surface Reactions in the Atmosphere. Chapter 11: Henry′s Law Constants for Compounds Stable in Water. Chapter 12: Henry′s Law Constants for Dissolution in Seawater. Appendix I: A Selection of Sources of Additional Data Currently Available from the Internet. Appendix II: Dissolution of Carbon Dioxide and of Oxygen and Fractionation of Oxygen Isotopes in the Environment.